Music Director/Conductor, Ira Spaulding, promises to offer up such a dynamic performance that even audience members who have heard the piece several times before will leave the concert with the feeling of hearing it for the first time. Spaulding is particularly interested in having the audience discover the many “ear visions” that are part of both the vocal and orchestral parts of the work, such as the chaos that came before the light, the sounds of the Garden of Eden, the heaviness of the large animals that walked upon the earth, and others. Maestro Spaulding has a 40-year career of performing, conducting and teaching conducting master classes in more than 60 countries all over the world, and currently holds the position of Professor of Vocal and Choral Music at City College of New York. His latest adventures included instructing talented young singers this past summer in Kurdistan and Lebanon, giving them their first experience with a foreign teacher. Hudson Chorale is pleased to be the beneficiary of his experience and artistic vision. During the majority of his musical career, Franz Joseph Haydn (1732-1809) was the most celebrated composer in the world, and is credited with being the father of the symphony and the father of the string quartet. 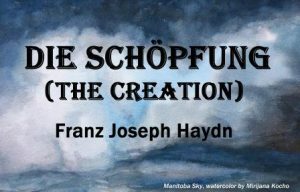 His oratorio, Die Schöpfung, is considered by many to be his greatest musical achievement. It was and is still loved not only by musicians and audiences but also by the composer himself who often conducted the piece. Shortly before his death, Haydn was invited by Beethoven to a performance of the work in his honor, conducted by a longtime friend, Antonio Salieri. Haydn was so moved by his own piece and the performance that he had to leave at the intermission, a testament to the emotional power of this masterwork.